This is a small area within modern Ceredigion, comprising the built-up area of Henllan village and its environs, on the north bank of the Afon Teifi at a point where the floodplain narrows. 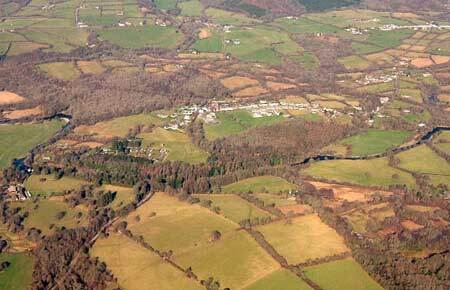 It lies within the medieval Cantref Is Aeron, in Gwynionydd commote. Old Ceredigion, including Gwynionydd, was briefly brought under Anglo-Norman control between 1110 and 1136, under the de Clare earls. It is probably during this period that most of the numerous castles within this Register Area were established, some of them possibly having been built during the Welsh reconquest of 1135-6. Few of them have any recorded history. The earthwork at Felin Cwrrws may be an early castle, but it is more likely to be Iron Age in origin, like the large multivallate hillfort south of Henllan itself. If it was re-used during the medieval period, it fell into disuse at an early date, and never became the focus for any later settlement, nucleated or otherwise. Nor did settlement develop around Henllan parish church, on the floodplain. The church is recorded in the late 12th century, but is almost certainly on an earlier medieval site, with a large circular churchyard of possible monastic origin. The church was was entirely rebuilt in the 19th century. The area remained in Welsh hands throughout the 12th and 13th centuries, until finally annexed by the English crown in 1283, when the county of Cardiganshire was created. Welsh tenurial pattern - with neither vills nor knight’s fees - has been largely responsible for the dispersed settlement pattern within the region. The Henllan village is entirely 19th and 20th century in origin and is not connected to the parish church, lying 0.5km to the northeast. The village is a similar distance from Henllan House, which is recorded as a late medieval gentry-house and water-mill site (corn mill). The character area is depicted in its present form on the Henllan parish tithe map of 1844, except for the village which did not then exist. Its development may have followed the establishment of two woollen mills, at Cwerchyr in 1840, and Trebedw in 1885, but they always remained peripheral to the main textile centre around Drefach-Felindre. The construction of the ‘Carmarthen-Cardigan’ railway line through the area - opened under the Great Western Railway in 1895 - and with a station at Henllan, clearly accelerated development, but it remained a relatively small village, comprising one street focused on the railway station. In c.1940, a camp was established for Italian prisoners-of-war on the southern approach to the village, eventually occupying 4.5ha and consisting of rows of Nissen Huts, most of which have now gone. The camp had largely become disused by 1944. Cwerchyr Mill closed in 1953, and Trebedw Mill in 1958, while the railway line and station closed in 1973. However, a short stretch of the line has been re-opened as a tourist attraction, the Teifi Valley Railway, and the P.O.W camp site is now used for caravans and camping, and a small industrial estate. Henllan is a small historic landscape character area located on a gently sloping south-facing valley side between 30m and 110m above sea level. It is a mixed area containing many disparate components, but essentially it consists of the late 19th century village of Henllan and the surrounding heavily wooded farmland. Henllan village, and its near but smaller neighbour Trebedw, are straggling linear villages, both late 19th century in character. Teifi valley slate, often cut and well-coursed rather than uncoursed rubble, is the main building material of the 19th century, sometime used in conjunction with yellow brick detailing, with north Wales slate for roofs. 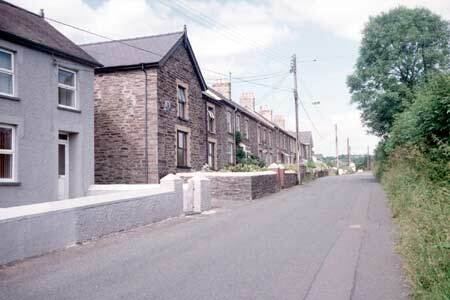 Worker houses are two storey, detached, semi-detached and terraced, as well single storey cottages. Henllan has a two storey single-built terrace with larger projecting end houses. There is also a corrugated iron church . Several small old industrial buildings are made of corrugated iron, particularly those associated with the railway, as are several agricultural buildings. Some of the original buildings belonging to the World War 2 prisoner-of-war camp on the outskirts of Henllan survive, including Nissen Huts and a unique, Grade II* listed corrugated iron chapel, converted from a dormitory block and decorated by the prisoners themselves. Most of the other buildings have gone. A section of the railway is preserved as a tourist line. Beyond the village, agricultural holdings are small, with houses and outbuildings dating to the late 19th century. The farmhouses are in the typical southwest style of the period: two storey, three bay with central front door and symmetrically arranged windows. Older outbuildings are stone-built and of one or two ranges. Corrugated iron outbuildings of late 19th and 20th century date are also present, as are small ranges of modern agricultural buildings. Hedges set on earth banks surround the medium-sized irregular fields. Many of the hedges are overgrown. Agricultural land-use is improved pasture and rougher ground. There is much deciduous woodland, some of which has probably regenerated over fields. Henllan parish church was entirely rebuilt during the 19th century. 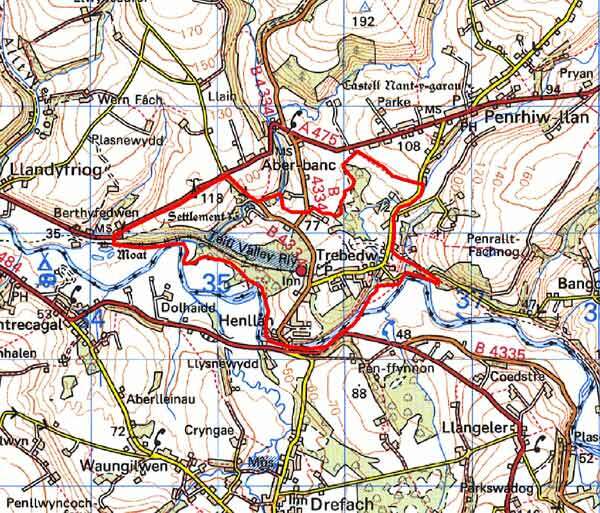 Two listed bridges, Pont Henllan and Pont Felin Cwrrws, lie within this area. In addition, archaeological sites include two Iron Age hillforts and the site of a corn mill. The 19th century industrial settlements and heavily wooded landscape distinguish this area from its neighbours.